Ever since I got my long Scallop Rectangle Nestabilities, I've wanted to make a cute little gift tag. This one measures 2 5/8" square and it's just the long rectangle folded in half. SERIOUS CUTENESS! So I thought today would be a good day to try it out and incorporate it into today's Whatchadoin' Wednesday Challenge for Storage Units, Ink and More! It's a fun challenge that I think everyone will (want to) be able to participate in, even if you combine it with another challenge. MAKE IT SPARKLY!! Yep, that's all you have to do--use glitter, rhinestones, Stickles, or whatever. We just want to see some sparkle! It's okay to use other stamps as well if you don't quite yet have any from Storage Units Ink. Just be sure and use keyword SUINKWWC2 when you upload to Splitcoast so we can see "whatchadid"!! 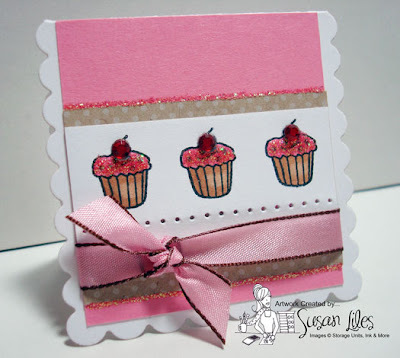 Cute and yummy card, Susan! Supah cute and sparkly!! Love it!! Glad to hear the rebel dog made it home safe! This is so stunning! I love your work and I've given you an award. You can get it at my blog...www.stamphappens.com. Thanks for the inspiration! So glad to hear you have the terror back with you lol! If you would like to visit me. I've left something on my Blog for you! Great tips for mass production and I agree....such pretty tags! !